I headed north from Edwardsville, IL (about 20 miles NE of STL) at 1:30 p.m. I knew that this chase was a long shot because 1) the most favorable area for tornado development was well to my north and 2) I had to be back to my office by 4:00 p.m. at the latest, which would not let me get more than about 40 miles north of Edwardsville. But at 1:25 radar was showing that a couple new strong cells had developed south of ongoing intense storms in NE Missouri, and I thought that if this backbuilding continued we might get something of interest just north of the STL area. I headed up IL 159 and could see a couple storms to my west and NW. By the time I was about 10 mi north, I had one impressive-looking storm directly to my west and another perhaps 10 mi. northwest, both moving rapidly to the NE. I decided to turn west and go through the town of Dorsey (2 mi W of 159 on a local road) to see what I could see. It was too bright and hazy to see the base of the storm at that point. But once I got closer it became clear that 1) the storm was not as strong as I had thought and 2) there were absolutely no lowerings under the base. So I decided to return to 159 and continue north, even though I was not sure I could catch up with the more impressive storm to the northwest. I continued through Bunker Hill to the end of 159 at IL 16, and went west a couple miles on 16. I turned north at the Beaver Dam State Park access road, and went about a mile. From there, it was painfully evident that I was not going to catch up with this storm. The other one to the south had dissipated, though there was still a flanking line extending well to the southwest from the storm that was now to my north. At this point, since I could not catch the storm and I was getting radio reports of new intense storms to my south in the STL area, I decided to turn east to try to see these storms. Since the cold front was becoming negatively tilted, it seemed to me that new action was more likely to the south or SE than on the flanking line to the SW. This turned out to be a misjudgement. I returned to 16 and proceeded east to Gillespie, turning south on IL 4 there to get a view of the storms to the south, which were continuing to generate warnings and reports of severe wx in the STL area. It was evident that I could not continue south without core-punching one of the storms, so I turned west on IL 138 at Benld hoping to get a view of the storm as it passed to the SE of me. I stopped a couple miles SW of Benld and watched the storm to my south for a few minutes. Before long, I determined that there was no way I was going to see much of this storm, because it was too obscured by rain. At the same time, I noticed that the flanking line I had been watching had put up two very hard, high towers that had begun to glaciate, one to my WNW and the other to my NW. I looked at the base of the one to my WNW and noticed a very substantial lowering, a wall cloud reaching perhaps halfway to the ground and tailing off to the southwest. But I could not see it well because it was quite hazy, and the storm was 8 to 10 miles away. Of course, had I stayed with the position I had been in earlier on the state park access road, I would have had a great view of this storm (probably would have had to retreat a little to the SE to get out if its way). Anyway, it was obvious this was the storm to chase so I returned to IL 4 and headed back north toward Gillespie. As soon as I was on 4 a tornado warning went up for Macoupin county, with a doppler-indicated tornado about 10 miles SW of Carlinville moving NE. This could have been in either of the two storms I was watching, but from the location reported I'd say it was more likely the same storm that was producing the wall cloud. As I went north into Gillespie, I could see a very distinct wall cloud and several small lowerings that may have been brief funnels. This would have been sometime around 2:45 p.m. But of course I was in town stuck behind a 5 mph hay wagon (do mesocyclones cause these?) so I could get only occasional glimpses of the storm, taking pictures out my window when I could. But the storm was still six or eight miles away, so my view was not good. When I finally got through Gillespie, the storm was looking a little less impressive, but still several distinct lowerings. It was racing to the NE as I pursued it up highway 4. It appeard to pass about over Carlinville and was almost due north of me when I stopped where the highway turns northwest toward Carlinville. I stopped on a side road, and videotaped the storm racing away from me, knowing I could chase it no further because it was now 3:00 and I had to return to work very soon. As I taped, it did put down one brief narrow lowering that had the appearance of a funnel at first, but detached from the parent cloud after 30-45 seconds so it may have been scud. After reviewing the video several times I am still not completely sure - looks like a funnel at first, but like scud at the end. By now the storm was probably 8 miles or so to my NNE, and moving quickly away. At this point I had to end the chase. 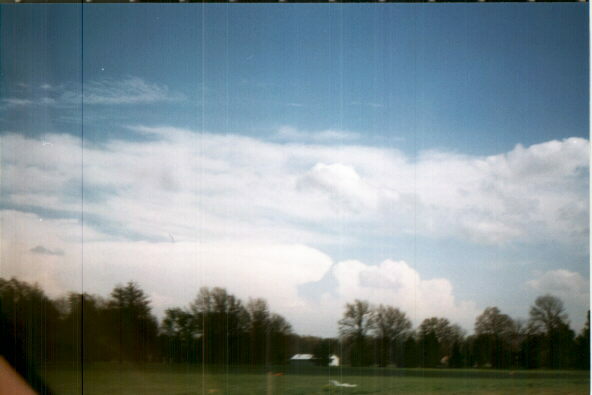 As I headed back toward Edwardsville in a sunny sky, I could see awesome towers to my NE, E, and SE, some with overshooting tops and backshear anvil. As I approached Gillespie from the north, the closest storm directly to my east, perhaps 10 to 12 miles away, developed a large wall cloud. Overall, this was a very impressive batch of storms, all individual cells rather than a squall line. On the way back I ran into winds behind the cold front, which was very close behind the storms. These winds were clocked at 50 mph in STL and 74 mph in Springfield, IL, and caused scattered damage and numerous power outages throughout the St. Louis area and much of Illinois. And since it had not rained in the area I was passing through, I also encountered the most awesome dust storms I have ever seen in Illinois. 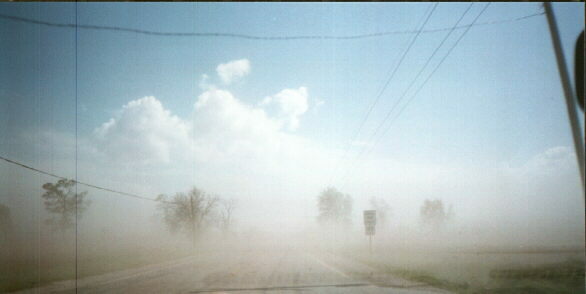 Visibility down to zero at times, with corn shucks blowing out of fields and pounding my car like hail. A few minutes after I got back to work at Southern Illinois University at Edwardsville, the wind knocked out power to much of the campus and did minor roof damage to one building. All in all an interesting chase, particularly given the time limitations, and an interesting wx day. TWC tthe next day reported 40 tornadoes, the majority of them in Illinois, but mostly farther north. The SPC storm reports and the STL newspaper showed no mention of a tornado from the storm I was on, but the TWC graphic did show tornadoes in the general area I chased. I also saw two newspaper mentions of a tornado in Montgomery County, to the east of where I was. One reported twin tornadoes moving out of that county to the northeast. I suspect this activity came from the storm in which I saw the wall cloud as I was on the way back. If anyone knows of tornadoes that occurred in Macoupin or Sangamon Counties from the storm I chased, I'd be interested in hearing from you; you can email me at jfarley@siue.edu. Pictures were added to this report on May 4.